Based on the wildly influential TB-303, the Roland TB-3 Touch Bassline is a performance-ready bass synth with meticulously authentic sound and intuitive controls engineered to play. Nobody could have anticipated what would happen to the world of dance music when Roland's now-legendary TB-303 was embraced by inventive musicians on both sides of the Atlantic. Since the 1980s, the TB-303 has been a staple of electronic music. It is the defining sound of Acid House and has since been the marquis instrument on an array of groundbreaking electronic dance tracks. It's not only been used to write songs, but it has songs written about it. In fact, the release of the TB-303 has been heralded as one the key events in the history of dance music. Not bad for a little silver box. Launched in 1981, the TB-303 continues to be an indispensable bass synth for dance music. Roland has meticulously analyzed the circuitry of the TB-303 piece-by-piece and down to the individual circuit behavior. Using Analog Circuit Behavior technology, Roland fully reproduced both the saw-tooth and square wave oscillators as well as the -18dB/octave ladder low pass filter used in the original TB-303, capturing that unmistakable cutoff and resonance character. In addition to the faithful reproductions of classic TB tones, the TB-3 is packed with 134 sounds that live and breathe. Bubbling synth basses, hard distortion basses, trippy delay sounds and drippy effects. They're all here - and then some. A TB bass line not only sounds unique, but it has its own trademark feel as well. The TB pulses. It drives. It bubbles and it percolates. 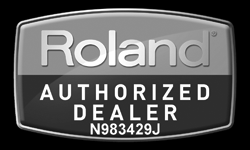 That's why Roland worked so hard to faithfully reproduce the Accent, Slide, and Step Sequencer behavior of the original unit. But Roland's vision went beyond simple reproduction. The truth is, the step entry on the original TB-303 was difficult to use, the keyboard was difficult to play, and special maneuvers were required for the shuffle functions. So they experimented with a variety of prototypes in their quest to create the optimal TB interface. 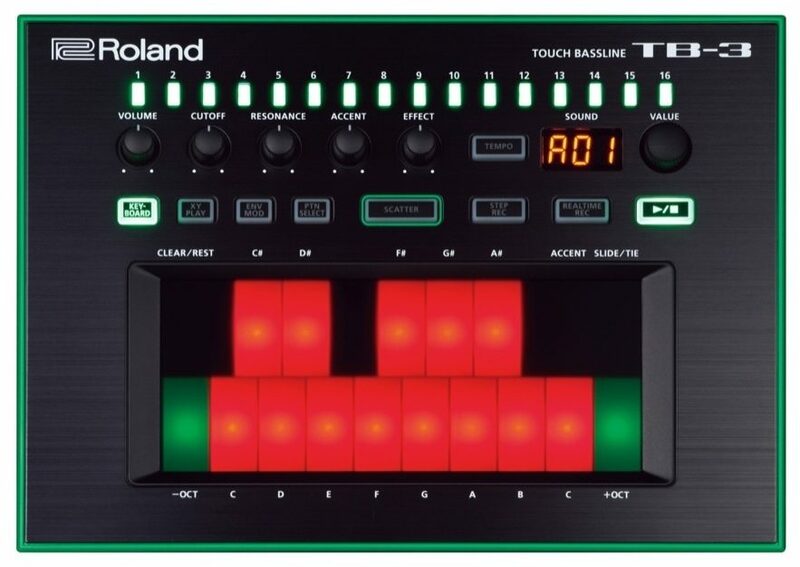 The TB-3 is equipped with a brightly lit, green and red, pressure sensitive touch pad that lets you seamlessly create patterns and interact with the unit during performance. In addition to pitch and volume, you can tweak filters and even control modulation by simply pressing down on the pad with your finger. It also makes the keyboard a breeze to play. 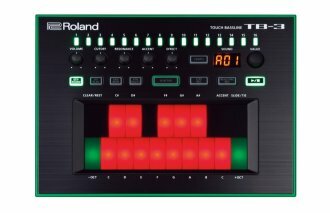 The TB-3's evolved Step Sequencer is a snap to use and allows seamless switching between pattern creation and performance. Of course, an attractive aspect of the original TB-303 was how it would sometimes generate unintended sounds as the user maneuvered through its complex and cryptic pattern creation operation. In order to inject that element of chance and discovery, the TB-3 has automatic pattern generation and random pattern modification. The TB-3's Scatter function features slicing, reverse, gating and other effects, instantly creating variations, stutters, and glitches that would normally require painstaking editing in a DAW. Complex, per-step functions are triggered easily with the Touch Pad and a single finger. Keep things fresh and interesting with 8 different types of Scatter variations and 10 levels of Scatter Depth - all controllable in real-time and in perfect sync. Available until 11 PM (EST) today. Mention special code 1ZY-DYNN when you call.